IOServer OPC Server 는 하나의 OPC Server에서 다음의 Protocol을 전부 지원합니다. address 와 Tag Name 만 제공되면 DCS Engineer의 도움 없이 바로 연결될 수 있다. 안 정 성 : Gateway에서 데이터를 취득하므로, DCS 시스템에 거의 영향을 주지 않습니다. 비용에 라이센스와 설치 서비스를 제공합니다. This driver access process data in field control stations (FCS) via the text-mode communication gateway unit (ACG10S-E). Connect to the ACG10S-E with TCP/IP Port Number 20005. 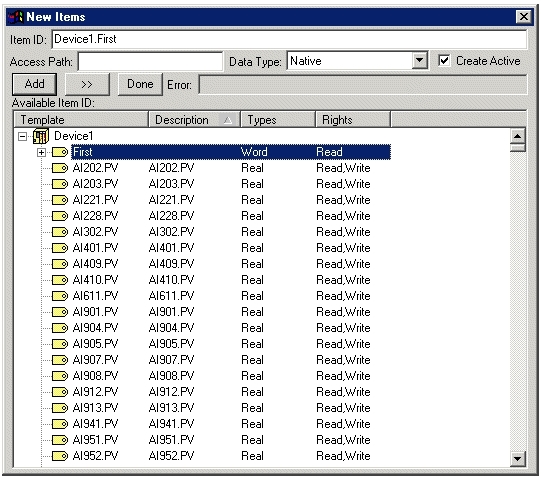 The Yokogawa driver uses the User Definable Protocol driver. Browse for ASCII protocol definition file. Requests are send to each device attached to this channel in parallel, without waiting for the response from the previous device. If disabled then only one request can be handled at a time per channel. Enable this option if more than 1 device is defined for the TCP/IP connection. Log all unmatched data longer than specified length. The sequence number (0 to 99) for this device. Each device must use a unique sequence number. The maximum number of devices supported is configured at the ACG10S-E gateway. Gateway (ACG10S-E)는 초당 500 포인트 이내를 권장하고 있지만, 1000 태그까지 무리없이 사용한 실적이 있습니다.